Setting up an OpenLDAP server on CentOS 7 and deploying NFS to export users’ home directories. Our OpenLDAP server resides on a 10.8.8.0/24 local area network. Generate an RSA private key with a certificate sign request. Quite a few LDAP schemas are available, import as required. Although only root can run slapadd, the slapd service runs as the ldap user. Because of this, the directory server is unable to modify any files created by slapadd. Our initial LDAP configuration file initial_config.ldif can be seen below . We enable all logging, set password hash to SSHA (rather than SHA), provide paths to SSL certificates and keys, put a high cipher suite to be used. The RootDN entry is the Distinguished Name (DN) for a user who is unrestricted by access controls or administrative limit parameters set for operations on the LDAP directory. We use cn=admin,dc=top for it. Note that our suffix is set to dc=top as we intend to use multiple domains under the tree (top domain component). We also define a guest account cn=autobind,dc=top for read-only access. This is mainly to bind to the LDAP server when anonymous binding is not allowed, for services like nslcd. All users have read access to their passwords due to “by self write” permissions. Create a base configuration file. This defines the top domain component dc=top as well as the admin and the autobind users. Apply changes, and then create a password for the autobind account (we left the userPassword field blank intentionally). We are now going to create a domain called lisenet.com with a couple of organisational units for users and groups. As we have a domain created, we can add some users. For those who already have multiple local user accounts created on a system, it would be wise to use the MigrationTools utility. The MigrationTools are a set of Perl scripts for migrating users, groups, aliases, hosts, netgroups, networks and services from existing nameservices (flat files, NIS, and NetInfo) to LDAP. 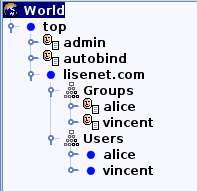 We’re going to create two LDAP users, alice and vincent, together with their respective groups. Home directories (/home/guests/) will be exported via NFS. Note the shadowLastChange value. We need objectClass: person to assign surnames, objectClass: inetOrgPerson for mail and given name, plus objectClass: posixAccount to set up user’s password. More domains and users can be easily added under the top domain component. Create home directories for LDAP users alice and vincent. Note the user id and the group id numbers which we used earlier when initially creating users on LDAP. Check the “related posts” section for how to configure CentOS 7 to use LDAP authentication with NFS automount. This entry was posted in LDAP/Kerberos, Linux, Samba/NFS and tagged CentOS, LPIC-2, NFS, OpenLDAP, slapd. Bookmark the permalink. If you notice any errors, please contact us. You made a pretty detailed guide!, nice work. Has anyone else had this situation?, cheers. Please make sure that you create the file initial_config.ldif as per instructions provided. Well done, I’m glad your fixed it! I’m now having a hard time getting Samba on a different server (Centos 7 too) to use this LDAP to authenticate the samba users. Do you have any howto for this? Nothing published on this blog I’m afraid. It’s a tricky setup because Samba relies on the host OS and therefore needs uid/gid for a user, which makes it challenging to integrate with LDAP. Good luck! Thanks for the detailed instructions.. Very helpful..
where does the startssl.ca.crt come from ? From StartCom CA (it stopped issuing digital certificates as of January 1, 2018). I’ve switched to Let’s Encrypt. Hi thanks for the guide, is there anything specific you neede to change to use Let’s Encrypt? You’re welcome! There isn’t anything specific you need to change to get LE working. In reality, you can use any CA that you want. How to configure Samba using this LDAP configuration ?